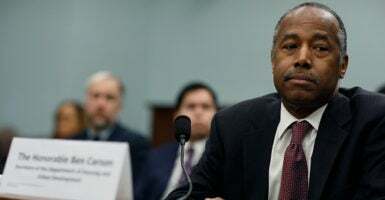 The Trump administration’s proposed work requirements for welfare programs would help revamp a public housing system that has trapped many Americans in poverty for generations, Carson said in an interview with The Daily Signal. Under Trump’s budget proposal for HUD, able-bodied adults getting rental assistance would be required to work at least 20 hours per week or attend job training or education classes. The requirement doesn’t include the elderly or disabled. “Our new rental proposals are helping to move people in the direction of self-sufficiency by helping to do things like assessing their incomes every three years, instead of every one year, so that you are not immediately deemed [ineligible] as soon as you start making more money, or bring an income-producing person into your environment,” Carson said. Trump’s 2020 spending plan includes a 16 percent cut to the HUD budget approved last year, but Carson noted it’s a 7 percent increase from what last year’s administration budget proposed for his department. Under Carson, a public-private partnership program to get private funds to renovate dilapidated public housing structures has reached more than 100,000 units and drew $5.8 billion in private investment. Carson said that HUD has accelerated the Rental Assistance Demonstration program, begun in the Obama administration, because it has been a good deal for taxpayers while increasing affordable housing for the needy. “There were a lot of public housing facilities that were deteriorating because the government’s old way of doing things was to come in and build this big, multifamily thing with no support around it, and disappear and go off to the next project, while it immediately started deteriorating,” Carson said. The Government Accountability Office released a report in February 2018 that said HUD should do a better job of tracking the system and tenants. “Without a comprehensive review of household information and procedures for fully monitoring all resident safeguards, HUD cannot fully assess the effects of [the Rental Assistance Demonstration program] on residents,” the report said. According to HUD, about 210,000 people moved into improved units, and if residents need to temporarily move during the construction period, they are entitled to protections under both the Uniform Relocation Act and the Rental Assistance Demonstration program’s relocation rules. The department has worked to address the GAO concerns by updating data gathering to avoid risks, and monitoring residents’ rights and safeguards. Before the program was in place, about 15,000 units were demolished or otherwise removed from the public housing listings per year, according to HUD. The rehabilitation of buildings often includes construction to mitigate health hazards, such as lead paint, and to make the buildings accessible to those with disabilities. Carson said it would have taken the federal government 46 years to generate the near $6 billion in private capital renovating the units, noting that the program created 108,000 jobs. The original cap on capital investment was for no more than 255,000 units, later raised to 455,000 units. The Trump administration’s budget proposal is asking to remove the cap entirely, so as not to limit any private investment. “A fiscal hawk, if they were a smart fiscal hawk, would say, ‘Wow, we are getting a lot of bang for our buck here by leveraging the public funding with private funding, and we’re getting a lot more done than we have in the past,’” Carson said. 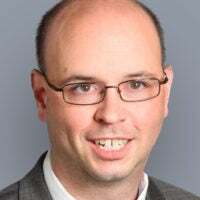 Without necessarily endorsing the Rental Assistance Demonstration program, Joel Griffith, research fellow for financial regulation at The Heritage Foundation, said he saw severe problems with government-owned housing. Cabrini-Green Homes in Chicago’s Northside drew national attention—before being demolished beginning in 1995—became emblematic of this government failure. Safe, affordable housing need not be synonymous with slums and violence. The success of hundreds of thousands of pleasant—privately owned—middle-class neighborhoods across the nation bears testament to this. The RAD program promises a transition—albeit only a partial one—away from the worst ills of government-owned public housing. Carson has been talking to local government leaders about scaling back land-use regulations that drive up housing costs. He said HUD has been looking at tying federal grants to local governments with deregulation. That includes zoning regulation, rent control, and environmental rules. Carson referred to Fort Worth, Texas, as a city that has been receptive to changing zoning laws and other regulations to make housing more affordable. After speaking to mayors of both parties, he said, he found bipartisan consensus in local governments to ease regulations. “So, we are just encouraging people to elevate [deregulation] in importance, because affordable housing affects a large number of people in our country,” he said. The HUD chief said 8.3 million families pay 50 percent or more of their income for housing, or live in substandard housing, or both. This is a problem that Heritage’s Griffith said he is glad to see HUD acknowledge.